Premise: Each contestant’s game is divided into 10 50-question rounds with the contestant playing against a challenger in each round. Each round has ten categories with five questions each. Once a contestant chooses a category, they will be faced with one of four types of questions: Regular, Battle, Top Ten Challenge and Triple Threat. For the regular question, contestant must answer correctly within 10 seconds with multiple guesses allowed. 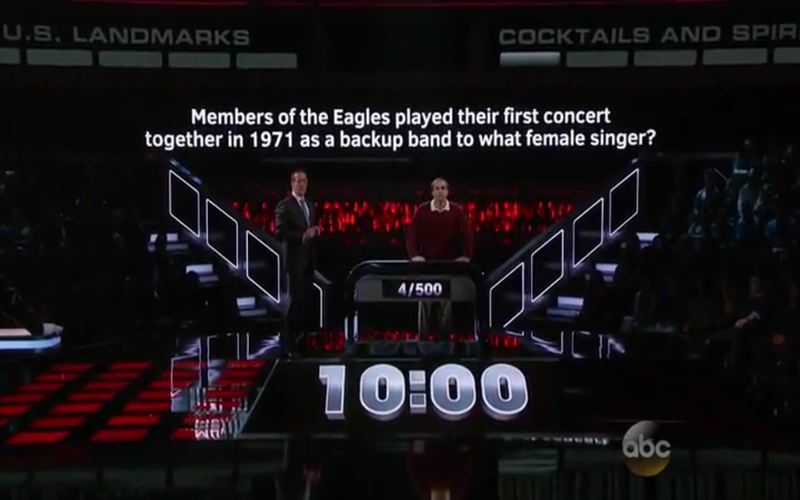 A correct answer on the first answer given adds $1,000 to the contestant’s bank. Otherwise, no money is awarded but the contestant remains in the game. If the contestant runs out of time before answering correctly, that will count as an incorrect answer and they will be given a “wrong” (essentially a “strike”). For the battle question, The contestant and challenger face a question with multiple answers and alternate giving answer until an incorrect answer is given or if a player’s five-second time limit expires while thinking of an answer. If the contestant wins a battle, they add $1,000 to their bank. If the challenger wins a battle, the contestant is given a “wrong”. For the Top Ten Challenge question, the contestant may choose to give or force the challenger to give five correct answers out of ten to a question within 15 seconds. The contestant banks $1,000 if they can give five correct answers or if the challenger is unable to in time. The contestant is given a “wrong” if they can not give five correct answers in time or if the challenger is able to do so. For the Triple Threat question, the contestant must give three correct answers to a question within the 10-second time limit. Three correct answers adds $3,000 to their bank. Otherwise, the contestant earns a “wrong”. If a contestant earns any “wrongs” in a round, the challenger selects the next category for the contestant to face and they can reset the “wrong” counter to zero with a correct answer or a successful Battle/Top Ten/Triple Threat win. Every 25th question is worth an extra $5,000 for the contestant to keep regardless of the game’s outcome if they can provide a correct answer on their first guess. If the contestant can answer their 50th question correct in a round, they win the bank and the challenger is eliminated from the game. If the contestant earns three “wrongs” in a row, the contestant is eliminated and the challenger takes their place. I will continue to update the premise section of this review as the week progresses. Awkward Mix Between Single Player & Head-To-Head Format: How the game is setup, it seems like the production team were torn on determining whether to make this a single-player game or a two-player game. 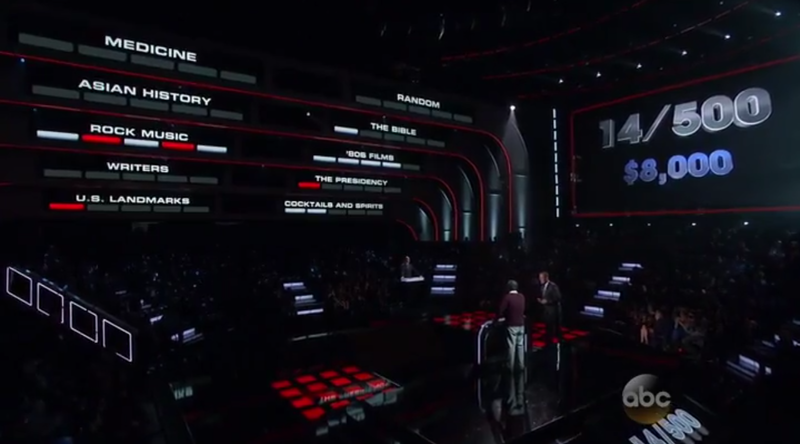 Since 500 Questions focuses more on the contestant at the main podium answering the non-battle and non-Top Ten questions, the producers should have developed this show exclusively as a single-player show rather than having the challenger not be an active participant in a majority of the gameplay. I don’t care for this weird contestant dynamic that meshes the two concepts. In a sense, it makes you forget at times that the main contestant is actually playing someone else in each round. Honestly, the show would be more interesting if they had implemented a solid two-player format and here’s one way they could have done it. In an altered two-player format, one contestant could maintain control of the game until they answer a question incorrectly and lose control to their opponent. Correct answers from either contestant adds $1,000 to the bank. A contestant wins the bank and the game upon either their opponent answering five questions incorrectly or reaching the 50th question with the least amount of wrong answers. Before the next game is played, the winning contestant may choose to answer one of three bonus questions that could double, triple or quadruple their bank if correct or respectively leave the contestant with half, a third or a fourth of their bank if wrong. Getting the challenger more involved with the game would improve the format and could also improve the flow of each episode. This brings me to my next point. Slow Gameplay: I also do not care for the show’s sluggish gameplay. Besides the relatively lengthy pauses in between questions and building up drama, I’m not sure why the game drags the way it does in an unnecessary manner. To put it into perspective, on the first episode, only 38 questions were asked in a span of 45 minutes while around 58 questions are asked on an average 22-minute episode of Jeopardy! and nearly 30 questions are asked in an episode of Cash Cab. It also doesn’t help the show’s flow that it takes a while for contestants to build up a decent bank total in a single show with each question worth $1,000. 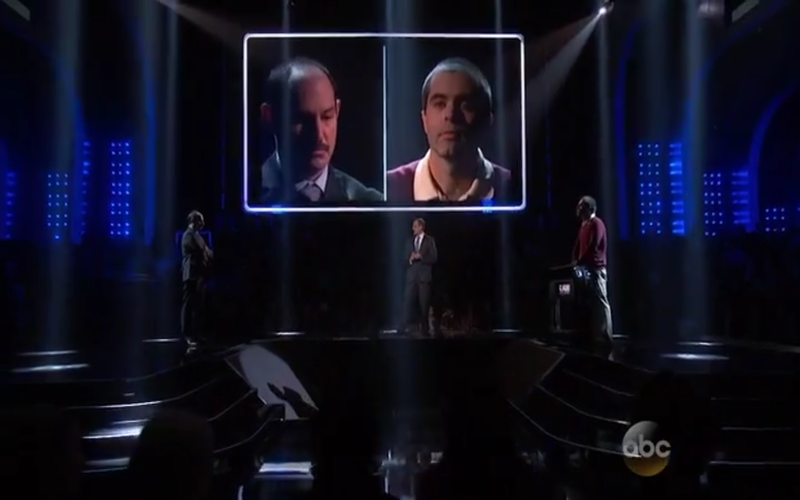 To see the show’s first contestant, Dan McCarthy, amass a paltry sum of $27,000 over the course of almost an hour on a primetime U.S. game show is not something that is going to keep viewers interested in the show for a long period of time in future episodes. Based on McCarthy’s earning $30,000 upon answering his 50th question correctly, it seems as if the contestant who makes it through all 500 questions could win between $300,000-$500,000 in a slow and methodical fashion. It wouldn’t hurt to speed-up the pace of the game especially considering the show’s low “$1,000-a-question-on-first” payout rate. 500 Questions could at least fit a whole 50-question round into one show and make each question worth at least $1,000 whether they answered correctly or not on the first try. “No Saves, No Helps, No Multiple Choice” Contradiction: 500 Questions’ “no saves, no helps, no multiple choice” mantra is a bit of a misnomer considering the contestants’ strike counter resets to zero with a correct answer (which “saves” them from elimination) and the contestants have several opportunities to throw out as many guesses as possible for just about every question to remain in the game. These two aspects takes out some of the toughness in the gameplay. Also, the show’s $5,000 guaranteed milestone bonus for answering every 25th question does not help the show’s toughness case. If you’re going to create “the toughest game ever devised”, you had better bring your A-game and pull out all the stops to create a format that is just as daunting and genuinely hard as game shows like Channel 4’s Fifteen To One and The Chase, where the questions are difficult, the margin of error is very slim and it makes viewers think twice before they even think about wanting to audition for the show. While there are a few improvements that need to be made in the format, there are few laudable elements within the show including the excellent array of hard trivia questions the contestants must face, the show not solely focusing on the big money aspect of the game, the contestants showing how brilliant and well-rounded they are when it comes to tough general knowledge trivia, the strategic, endurance and pure knowledge aspects of the game and the show’s smart, energetic and enthusiastic host Richard Quest who tries to keep the game as dramatic and intense as possible. (Although, Quest could dial it back a little considering he’s hosting a game show and not a gladiator fight to the death in the Colosseum.) Should the show be renewed for a second season, I would like to see wider variety of contestants compete rather than only the ones who have credentials and accolades that classify them as geniuses. One of the intrigues of trivia game shows, especially special event series, are seeing everyday people who come from all walks of life being handsomely rewarded for successfully displaying their wide depth of knowledge in a variety of subjects. Even though I’m not completely sold on 500 Questions just yet, it’s not the worst game show to air on ABC. Buzzerblog released an interview clip of a member of the production team who seemed optimistic about 500 Questions returning for a second season. After watching the first and second episodes and considering the series premiere only attracted 5.03 million viewers, I don’t see ABC rushing to renew this show for a second run. I can’t envision a lot of viewers watching the show faithfully and seeing the 500-question counter reset to zero as each contestant falls game after game while winning an average of less than $100,000 per appearance. I just can’t see it. Watch new episodes of 500 Questions from May 20-May 28 at 8:00pm EDT on ABC! Previous Post Quick Review of "Pontoon Payday"
I was looking forward to watching the new ABC 500 questions game show but had to turn it off because I hate the voice of the game host. His voice actually makes me nauseous. I think ratings will tank quickly unless they change things. You had better replace Quest soon or this will die. He has no credibility as MC. He had no credibility on CNN as a supposed aviation expert. Must have been self proclaimed because he sure didn't exhibit any depth of aviation knowledge there. That is to say nothing of his obnoxious style. Get rid of him if you want the show to last. Otherwise it will surely die.